Of late, the Mumbai-based Parsi Dairy Farm appears to be unwittingly milking the benefits of what it dismisses as a rumour-based report. Visits to the 99-year-old establishment tripled after a newspaper carried a front-page story saying the brand would soon be put on the block. “People are dropping in for a last taste. We have become famous again,” says an employee. The dairy, as June Gonsalvez, manager of its flagship Princess Street outlet, tells you, has no plans of a sale. It is not the first time a closure scare has led to hurried final trips and a flurry of laments or tributes on social media. The 100-year-old B Merwan bakery on Grant Road, too, experienced a surge in interest last March, following reports the space would be lost to redevelopment. Fans lined up at 7 am to shop for what they imagined would be the last of its buttery cardamom-laced mawa cakes. Curiously, however, the establishment re-opened after two weeks of repairs. Founded by Nariman Ardeshir in 1916, Parsi Dairy Farm made a name for itself by delivering rich hygienic milk and milk products. It was also unique in that it dressed its milkmen in cobalt-blue shirts and khaki shorts. Kulfis and sweetmeats were soon added to its shelves. Even today, these enjoy demand in other Indian cities, as well as in West Asia, though there are signs of a struggle. Clients primarily comprise Marwaris and Parsis in areas such as Walkeshwar, Cuffe Parade and Colaba. Parsi families still source sweets such as mawa ni boi and aghani no larvo for special occasions from there. “When babies in Parsi homes are weaned off breast milk, they are given Parsi Dairy Farm milk. But after the initial years, people now switch to cheaper options,” says Perzen Patel, a food blogger and caterer. The number of milkmen has apparently come down from 400 in its heyday to about 150, according to another staffer who requested anonymity, as they have been instructed not to share comments. In Delhi, changing eating habits among new generations and stricter pollution control measures hurt business at Ghantewala, Chandni Chowk. Though activities are in full swing in the market, the essence of the ‘world-famous’ sweetmaker’s sohan halwa and pista barfi is missing. Founded in 1790 by Lala Sukhlal Jain during the rule of Shah Alam-II, the renowned sweet shop catered to the taste buds of thousands, including from royal families, modern-era politicians and celebrities. It boasted of fans such as former prime minister Jawaharlal Nehru, artist M F Husain and singer Mohammad Rafi. Jain’s family successfully ran the business for about 200 years, though it had to be split among various members. Sushant Jain, a seventh-generation descendent of Sukhlal, now owns the original shop. The business was served several notices during the late 1990s by the Delhi Pollution Control Board for alleged violation of air pollution norms, and was asked to move its production unit. As income from the business dwindled, it became difficult to sustain this legal battle and shutters were downed. Zakir Ali, whose family has been living inside the walled city for centuries now, misses the crowd gathered in front of Ghantewala in the run-up to festivals. “Sweets from Ghantewala were a must during Eid at our home. We were lucky to taste those for years,” he says. Old establishments increasingly find it hard to cope with shifting tastes. These are usually small, family-owned businesses that take longer to modernise and some of them are not keen on changing. 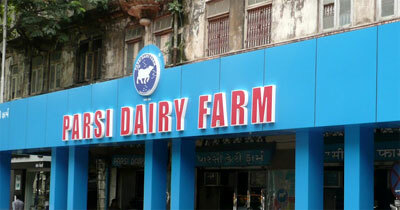 While the Parsi Dairy Farm added new products and opened two new branches, it has not been able to move swiftly with the times. Its milk still needs to be boiled, unlike other homogenised and pasteurised brands available locally, says Perzen Patel. And, though shoppers at the Princess Street store typically buy in large quantities, payments are accepted only in cash. Also, as cities spread and people move homes, such establishments with one or two outlets are gradually neglected. For instance, Cafe Samovar, which was forced to vacate its space within the Jehangir Art Gallery in March, had patrons returning in throngs during its last days. It seems nostalgia, unless accompanied by urgency of certain death, isn’t a strong enough compulsion for admirers.